This posting is long overdue, and my apologies to all three of you who read these; much has been happening at the Academy since GG IV returned in March. I have given a number of lectures at the Academy and elsewhere on our island work, and I have one more to go at professional meetings in Capetown in a couple of weeks. Both Dr. Tom Daniel and Jim Shevock have also spoken on our island work, and Roberta Ayres just gave a talk to the public on our Gulf of Guinea Islands Biodiversity Center idea. Along with working on the material we brought back, we all have also been involved with a small exhibit on GGIV which has just been installed on the Academy public floor. Gulf of Guinea Expedition IV exhibit – RCD phot. 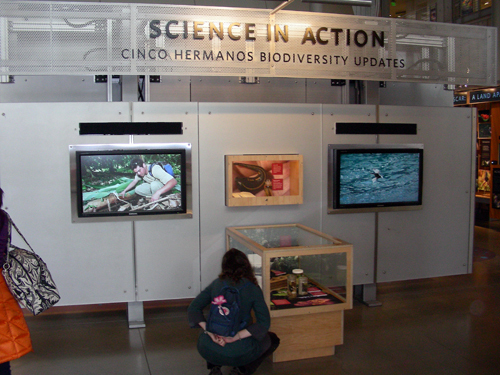 The screen on the right is an ongoing 10-15 minute narrated video, and the one on the left shows a continuous series of slides of the fabulous island critters and plants; a few of our preserved collections are displayed in the vitrine case in front. The exhibit may look small but a lot of people will see it; the Academy reopened in September of 2008, and a couple of months ago we had our 2 millionth visitor. I took the picture below just a few moments ago. 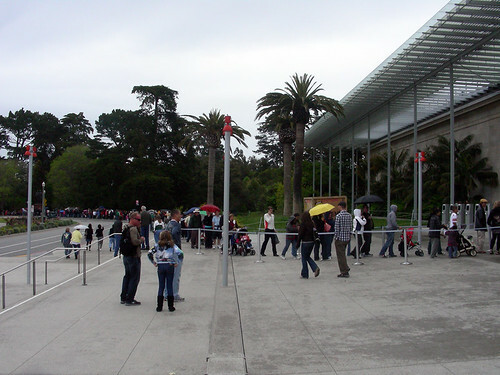 It is a rainy day in San Francisco but all of those folks are waiting to get in! Academy entrance: 19th May 2010; 1230 hrs- RCD phot. Speaking of talks (and to continue from the point where I left off in the last posting), when we returned to São Tome from Principé I was invited by Dra. Alzira Rodrigues, the Presidente of Instituto Superior Politécnico, to give an address on island biodiversity at that institution. The ISP is the highest educational institution on the islands, although it is not a college or university per se. 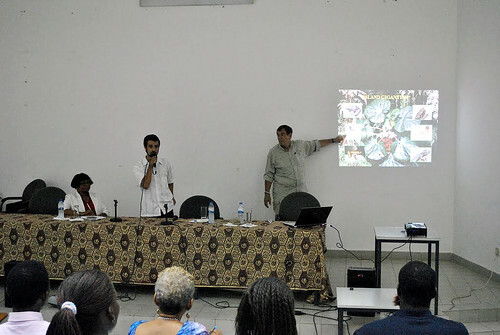 Alzira is seated on the left, and the translator (with the microphone) is our old friend, Bastien Loloum, head of Suntabawe Ltd., an island consulting firm. Bastien has been interacting with our GG teams for many years and has been a vital part of our future educational project. March lecture at ISP, Sao Tome. P. Anderson phot. 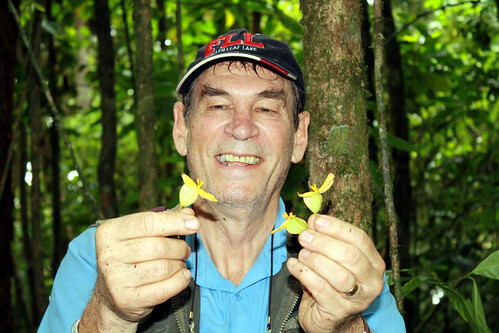 It has taken many weeks of work, but Tom Daniel came into my lab this morning with the news that our tiny Begonia from extreme SW Príncipe is probably not a new species; instead, it seems to be a species known also from São Tomé, tiny Annobon (southernmost in the archipelago) and mainland Gabon called B. annobonensis. There are some striking differences between these tiny flowers and the São Tomé material we have collected, but for now we prefer to remain conservative, name-wise. 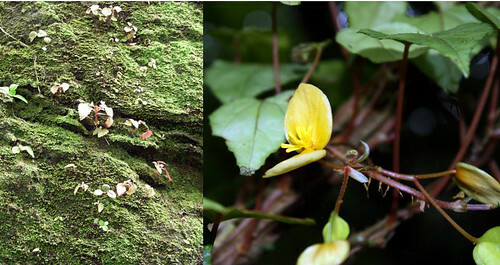 Moreover, the gorgeous yellow vine Begonia I fell in love with a few blogs ago turns out not to be B. macambrarensis, but rather B. thomeana ; it occurs on both islands and also Annobon but is absent from Bioko. I guess it’s OK that we got the name wrong.… she never calls, she never writes, anyway! Some very exciting news is that we collected a plant family never before recorded in the Gulf of Guinea Islands, a member of the Triuridacea! Prior to GG IV, Sciaphila ledermannii was known only from Nigeria and Cameroon and considered quite rare. 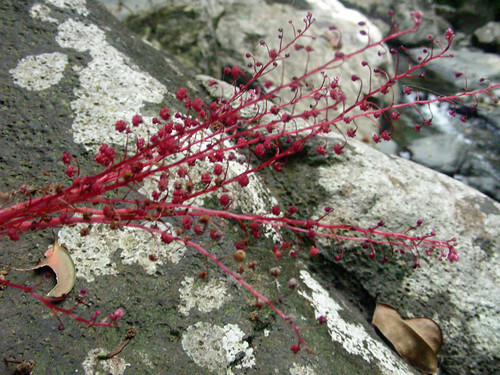 We found this plant along streams in two remote parts of Príncipe. These entirely red plants lack chlorophyll and instead of manufacturing their own food by photosynthesis, they live off dead and decaying matter. They are known as “holosaprophytes.” So far as we know, not only is this a new plant family, genus and species to add to the growing and impressive list of the biota of São Tomé and Príncipe, it is only the second saprophytic plant known from the oceanic Gulf of Guinea Islands; the other is an orchid species found on Annobon — fun stuff! The distribution of this species is biogeographically intriguing, and I will address this in a later post. Remember Afrocarpus mannii, the big tree found only on the higher elevations of São Tomé and nowhere else? 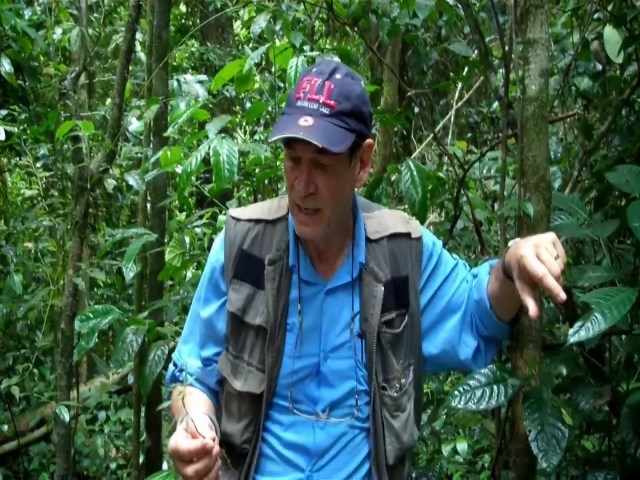 I wrote about it a couple of months ago as being one of our goals for GG IV in “Return to Paradise.” In that post I included a map of the distribution of this tree and its closest relatives. 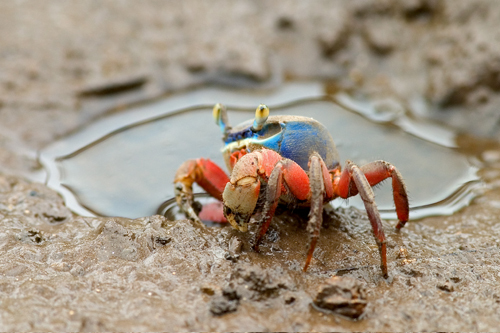 Simply stated this island species is thought to be at least 2000 miles west of the rest of its group. We found lots of them at about 1500 m, high up on a ridge called Morro Provaz on a steep trail totally missed by our earlier expeditions. Tom Daniel got samples for DNA analysis, and we made a short video explaining the importance of the specimens. 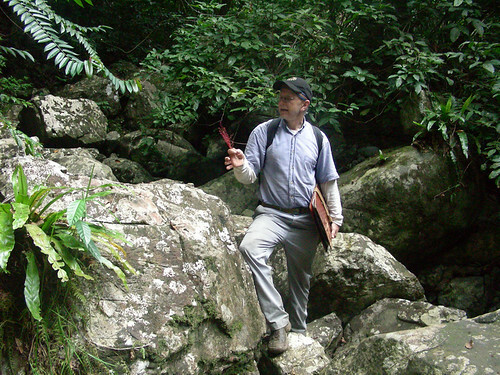 Jim Shevock’s bryophyte survey (mosses and allies) finally reached over 700 collections, many species of which he is sure are new to either São Tomé or Príncipe, or perhaps both. This was a monumental effort. He has sent some of these collections to specialist colleagues at Penn State University, the Technische Universität in Dresden, a colleague in Ady, Hungary, and two friends at the University of Helsinki, and we will await their findings. There is much, much more to come, including millipedes, shrew updates and cool fish stuff. Stayin’ close to home. Weckerphoto, GG III. 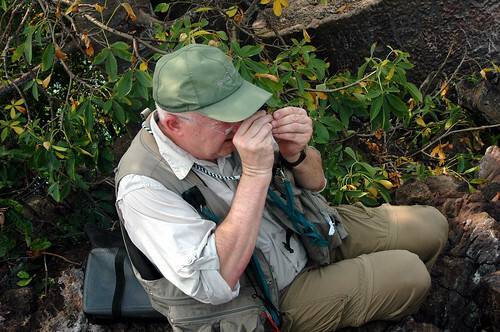 We gratefully acknowledge the support of the G. Lindsay Field Research Fund, Hagey Research Venture Fund of the California Academy of Sciences, the Société de Conservation et Développement (SCD) and Africa’s Eden for logistics, ground transportation and lodging, STePUP of Sao Tome http://www.stepup.st/, Arlindo de Ceita Carvalho, Director General, and Victor Bomfim, Salvador Sousa Pontes and Danilo Barbero of the Ministry of Environment, Republic of São Tomé and Príncipe for permission to export specimens for study, the continued support of Bastien Loloum of Zuntabawe and Faustino Oliviera, Curator of the Herbarium at Bom Sucesso. Special thanks for the generosity of private individuals, George G. Breed, Gerry F. Ohrstrom, Timothy M. Muller, Mrs. W. H. V. Brooke, Mr. and Mrs. Michael Murakami, Hon. Richard C. Livermore, Prof. & Mrs. Evan C. Evans III and Mr. and Mrs. Robert M. Taylor for helping make these expeditions possible.